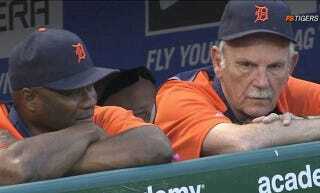 At some point during the Tigers' 12-game win streak, we unfortunately learned this week, manager Jim Leyland and hitting coach Lloyd McClendon stopped changing their underwear. Detroit lost to the A's 6-1 last night—still a partial victory for everyone else in the Tigers clubhouse. [Leyland] also started wearing the same baseball socks every day at some point during the streak, along with another item of clothing. "I will wear these underwear until we lose," Leyland said. "I can tell you that right now. And they will not be washed. And I don't give a (expletive) who knows it." Leyland also told the Free Press that he was smoking a Montecristo cigar every day during the streak, which, of course, he will continue to do, because he is Jim Leyland. It has been reported that the two are wearing fresh underwear today.